CMC release of miniature scale model of a 1935 Auto Union Type C racing car. Model is made of zinc in 1:87 scale. Released to celebrate CMC's 15 Year Anniversary and made in a limited edition of 5000 pieces worldwide. 1 x Limited Edition CMC Diecast Model Car (CMC Part Number M-194). Supplied with protective film around the model, handbook and limited edition certificate. THIS IS A COLLECTOR'S OR DECORATIVE ITEM. 1 x Limited Edition CMC Diecast Model Car (CMC Part Number M-193). Supplied with protective film around the model, handbook and limited edition certificate. THIS IS A COLLECTOR'S OR DECORATIVE ITEM. A004 - Collectors Display Case, wooden base with felt underside. and clear perspex case top. Suitable for : 1:18th and 1:24th scale models. No models will be dispatched until funds are cleared. ALL PARCELS. 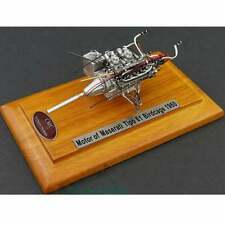 CMC - MASERATI 300S ENGINE with SHOWCASE M-110 1:18 - NEW ! MY CARS ALWAYS BEEN ON THE ORIGINAL BOXES, IN PLACES WITHOUT ANIMALS AND NO SMOKING. Gianni Zagato has succeeded with its soft design language and its famous curves to tailor a body that may just inspire you. Zagato was famous for the extraordinary lightweight construction of its bodywork. Type : TALBOT - LAGO COUPE TYP 150 SS FIGONI & FALASCHI 1937. - Manufacturer : CMC. - EAN : 0660042340207. By CMC in 1:18 Scale CMC M-144. Not quite as prominent, but also strong formative influence on the public image were the racing car carriers. After great successes, they were pulled down with planning the victorious Silver Arrows to the enthusiastic audience. Jaguar Type C Dr. Jenny 1952 Cchristian. Fabricant CMC. Type Voiture: passager. Fabricant CMC. Auto Union Type C 1936. Limited 5000 Ex. Type Voiture: passager. Auto Union V16. Reference: M.034. Numéro de pièce fabricant M.034. Type C 1936. Année du véhicule 1936. Racing car. Type du véhicule Voiture de sport. mggm2005 (9840). The second variant was the production vehicles built from 1952 – from chassis number XKC005 to XKC049, also with drum brakes and SU carburetors, but with swept air outlets on the hood. On June 14, 1953 at 16:00 the Jaguar Boys had their job done. MPN CMC115. Producer/MANUFATCURER: < span class = "notranslate" > CMC. Original Scale Model. Peso/Weight: Kg < span class = notranslate ' > 1.2 . LIMITED EDITION ITEM (1.500 PIECES)! CMC - FERRARI TESTA ROSSA 1958 LUCYBELLE II Le Mans 1/18 - M-086 - NEW ! CMC - FERRARI TESTA ROSSA 1957 PONTOON FENDER #124 M-081 1:18 - NEW ! Manufacturer : CMC. - Type : JAGUAR TYPE C - BRITISH RACING GREEN - 1952. - Color : Vert. - EAN : 0715235276969. By CMC in 1:18 Scale. Scale 1:18. You are buying directly from Mint Models in Latham, NY. Factory Sealed! Mint in Box! Fabricant CMC. Type Voiture: passager. EAN Non applicable. By CMC in 1:18 Scale. Material Diecast. Scale 1:18. You are buying directly from Mint Models in Latham, NY. Factory Sealed! Mint in Box! LIMITED EDITION 1.500 pieces. FANTASTIC DETAIL! COLLECTORS ITEM! Fabricant CMC. Lancia D50 1954. Matière Monté métal. EAN Non applicable. MPN CMC158. Producer/MANUFATCURER: < span class = "notranslate" > CMC. Original Scale Model (in new conditions mint boxed). PRODUTTORE/MANUFATCURER: CMC. Original Scale Model (in new conditions mint boxed). Talbot-Lago T150 C - SS Cup Figoni & Falaschi 1937. Fabricant CMC. Matière Monté métal. EAN Non applicable. MPN CMC163. With its deep blue coloured Daimler-Benz paintwork, the soft curves of the chassis and a max. After Daimler-Benz withdrew from Formula 1 racing at the end of 1955 this vehicle disappeared from the public view. PRODUTTORE/MANUFATCURER: CMC. Original Scale Model.